What is Pravachan Player Software? Pravachan Player is custom made software which is used for playing Param Pujya Sadgurudevshree Kanjiswami's Lectures (Pravachan) on your computer. It has lots of features discussed below. View/Read word to word text while listening to the Pu. Gurudevshree's Pravachan. This comes with self-guided underline that marks the exact text that Pu. Gurudevshree is speaking. Watch different photos of Pu. Gurudevshree while listening to the Pravachan. Auto Play : Preplan your future schedule of playing the Pravachan. Then as per the plan, it will start to play the Pravachan automatically (computer must be turned on for this feature to work). For more details, please check Auto Play section on the User Guide file. Copy as well as Delete Pravachan from CD/DVD to Harddisk. Video CD/DVD can be played as well. Play First or Second half (30 Min) of the Pravachan. Full list of Pravachans from where you can play any Pravachan (Provided Pravachan copied into Harddisk). 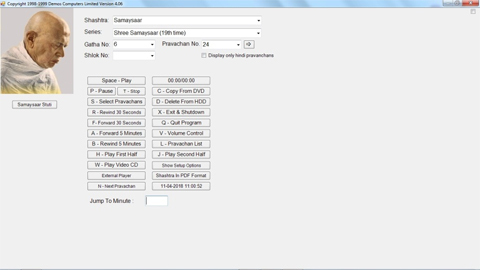 Pravachan Player can be set in any one of these 3 Languages (English / Hindi / Gujarati). Pravachan Player 5.48 Beta currently only plays Yogsaar shastra. Use Pravachan Player 4.06 for all the shastras. Pravachan Player 5.48 Beta - This version displays word to word text while listening to the Pu. Gurudevshree’s Pravachan. It is currently under development and published for testing only. Sadharmis are requested to use it and share the feedback using our contact us webpage. First download the software as per PC operating system, Yogsaar audio and Yogsaar text in your preferred language. Store all these files in a folder. You may name it as 'Pu. Gurudevshree Pravachan'. It is mandatory for all the downloaded files to be stored in one folder. Now, run the Pravachan Player application. Application file has .exe extension in the end. Allow 1 minute for software to link all the files. Pravachan Player screen as shown in above picture will open. You are now ready to play the pravachan. Follow the commands as seen on screen. You can also get Pravachan Player software on Pen-drive (or any other electronic storage device) from "Shree Kundkund Kahan Parmarthik Trust" office at address mentioned below. Please ensure you bring the appropriate electronic storage device with at least 2GB storage space. First download the software by using given link, after downloading run Vitragvani.exe and follow the on screen instructions. After the installation is completed click on the start » programs » pravachan player. Once "PRAVACHAN PLAYER" program starts, you can use commands as seen on screen. You can also get Pravachan Player Software on CD from "Shree Kundkund Kahan Parmarthik Trust" office at address below. Please contact us at address &/or telephone number below for any queries or any difficulties with any version of the software.